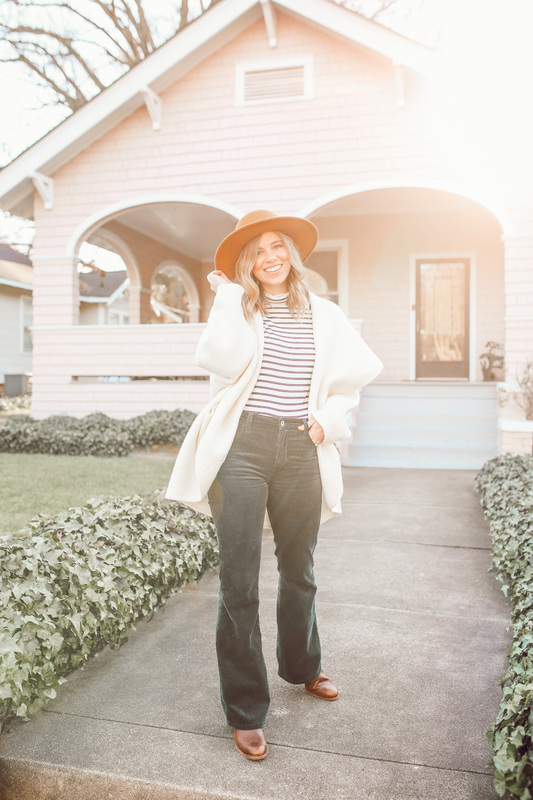 Lately my go to casual winter uniform has been little different! Spicing things up with some new favorites and sharing pieces I found myself reaching for more times then not. Who else is beyond thrilled January is over? Seriously felt like the longest month ever. While I was writing my January recap last Friday, I felt as though the events I was talking about were a month or two in the past. So crazy! Not only was it extremely long but it was also extreme cold, rainy, cloudy, and just pretty gross overall. Which now that I think about it is probably partially why it seemed so long. With these gross days I found myself not wanting to leave the house…for anything except the gym. And the motivation to do so was pretty slim (thank goodness for FWTFL and the motivation to at least make it to the gym). Anyways, where am I going with all of this? Somehow I’m working on getting to today’s look, my go to casual winter uniform. 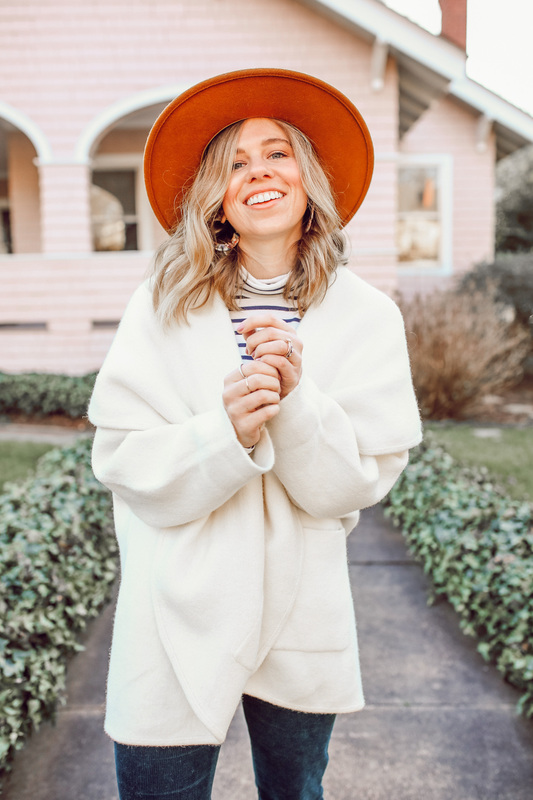 A look that has come together due to wanting to be cozy, comfy yet put together and ready for in-person meetings, coffee dates, and getting together with friends. You know, those times I did have to venture outdoors in January and now that February is shaping up to be beautiful, am wanting to! Can we take a second to talk about how gorgeous February has been? If you’re in the Charlotte area is has been sunshine every single day #praise. Luckily, all of these occasions I am dressing for allow me to veer on the side of more casual. Hopefully, your office is similar in that way or your friends like to dress a little more on the casual side for get togethers. 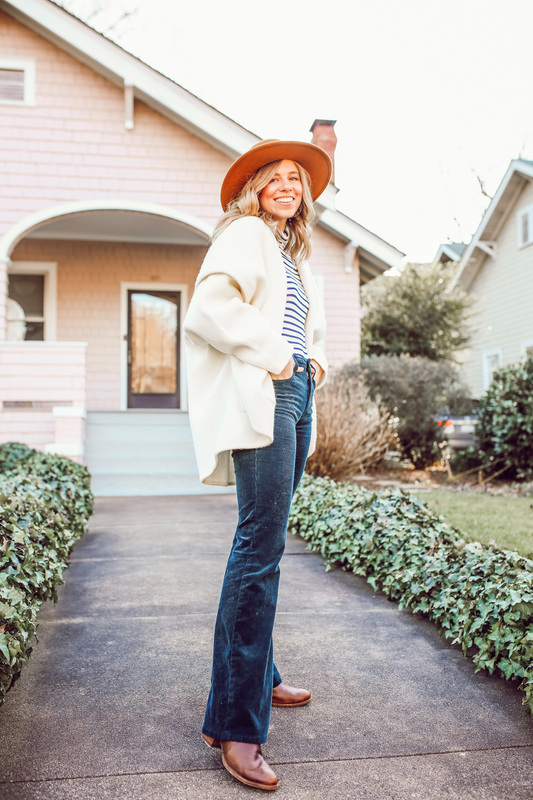 When I’m tired of reaching for my favorite madewell high-rise skinny jeans, you can find me in these anthropologie corduroy high-rise pants. They are comfortable, provide a little extra warmth, and are a fun option when you want to switch things up a bit. 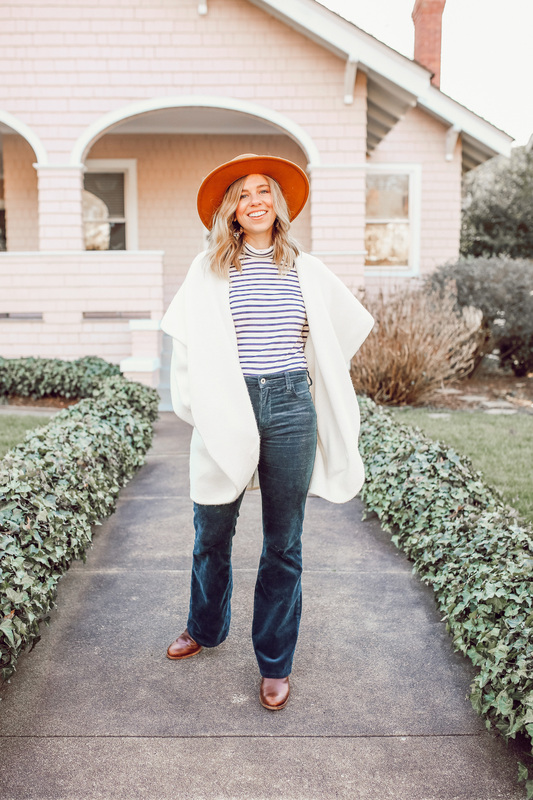 You can wear denim all year round but corduroy is here for fall and winter and that is that! So I’ve found myself reaching to wear the fabric for more casual occasions more times then not. 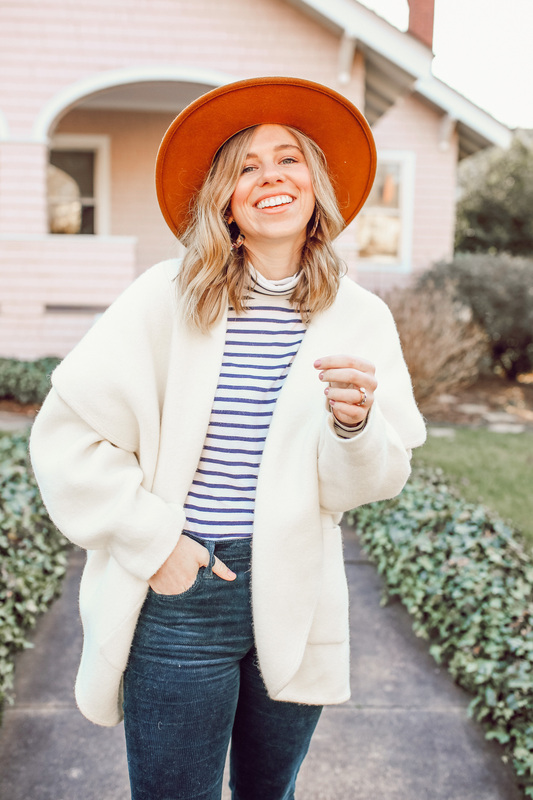 Another versatile piece in this casual winter uniform of mine, is this perfect fit turtleneck from J.Crew. Literally layers perfectly under SO much! A great extra layer when a little extra warmth is needed. Recently wore it with my heart pom sweater and over the little pattern play. I’ve purchased these turtlenecks from J.Crew every year for the last three to four years. They truly do fit perfectly and again, go with so much! Definitely a great piece to pick up – especially right now, they’re on sale! Lastly: I’ve topped the look off with this chic, cozy cardigan from Anthropologie. A great option for when you don’t feel like wearing a coat but need the warmth of one. Instantly ups your outfit but totally feels as though you’re wearing a robe. Total win in my book! Comes in dark turquoise, grey, and carbon if you can’t be trusted with ivory. What pieces do you gravitate towards for your casual winter uniform? 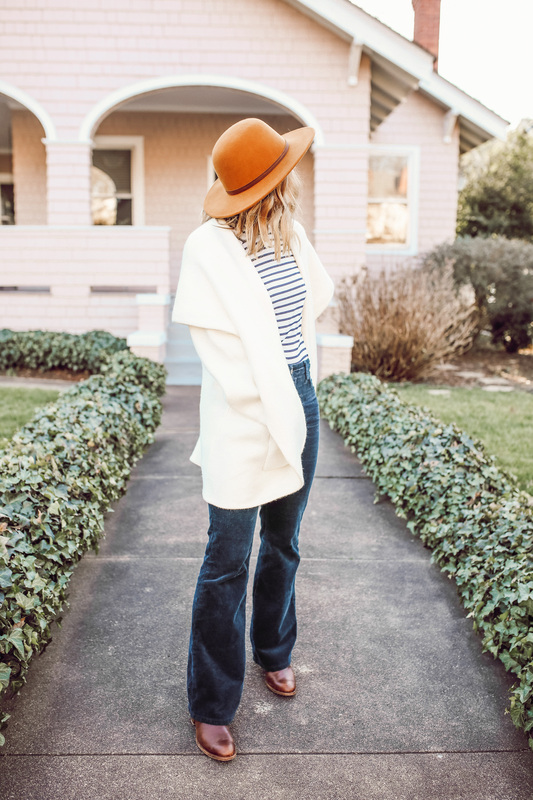 That coat is the most perfect layer and I love switching out denim for a good pair of cords! Isn’t it? It was definitely love at first sight when I spotted it. Glad you’re a fan of cords as well! OMG my new favorite winter look of yours! 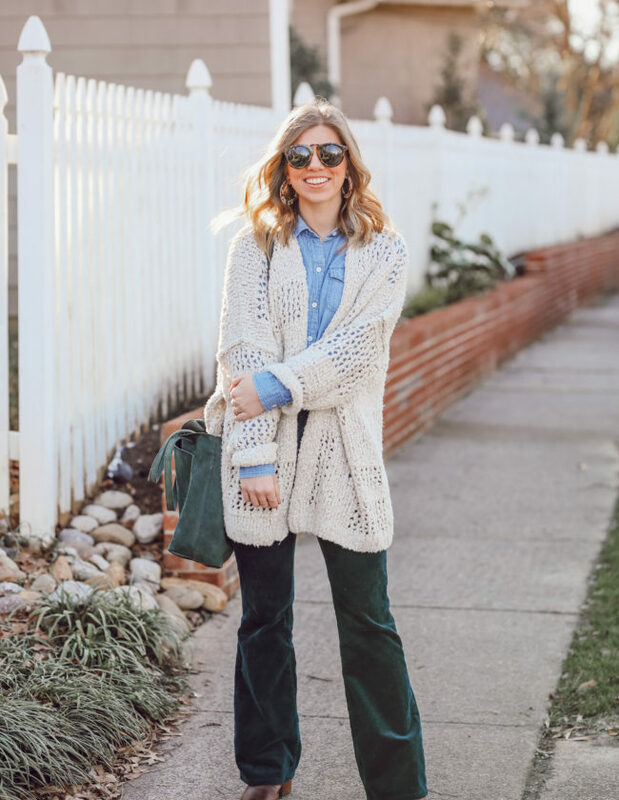 I absolutely love that cardigan – I think I need it! 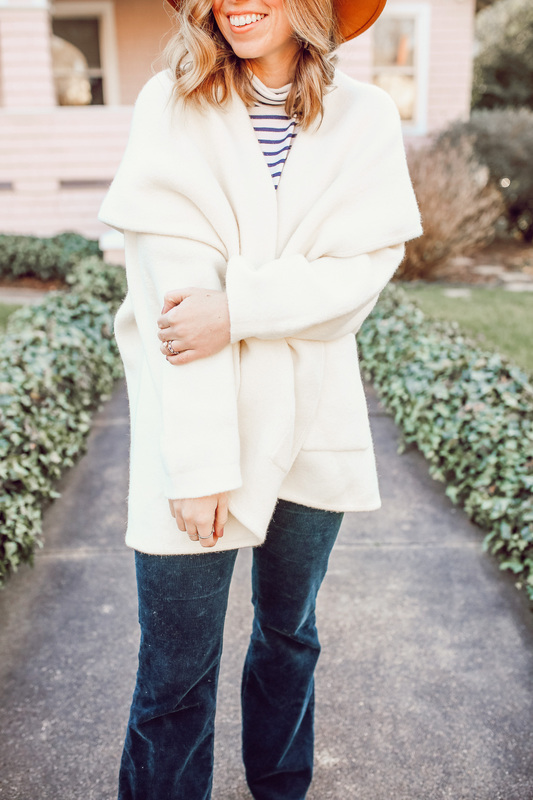 I always reach for my Levi’s and a cozy sweater in the winter with my fur mules! Ah yay!!! So happy to hear that! And yes, you do 100% need it in your life. Your casual winter uniform is a pretty solid one, I like it! 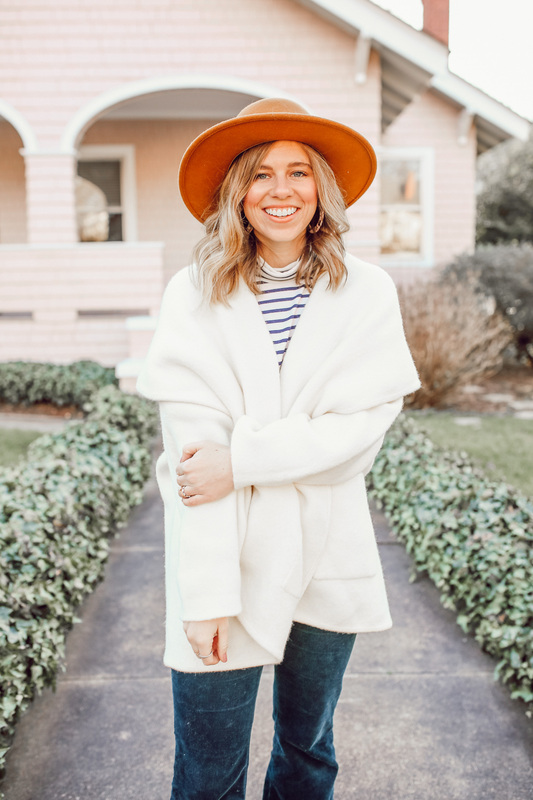 This is such a cute, cozy look! That cardigan has me feeling warm by just looking at it ha! Thank you Emily! Haha right? Pretty sure that’s what pulled me to pick it up and take it straight to the fitting room. Ooo I love that cardi (and the corduroy)! That hat is also super cute on you – such a nice color! Looking as great as ever. I seriously need to bite the bullet and try FWTFL asap! 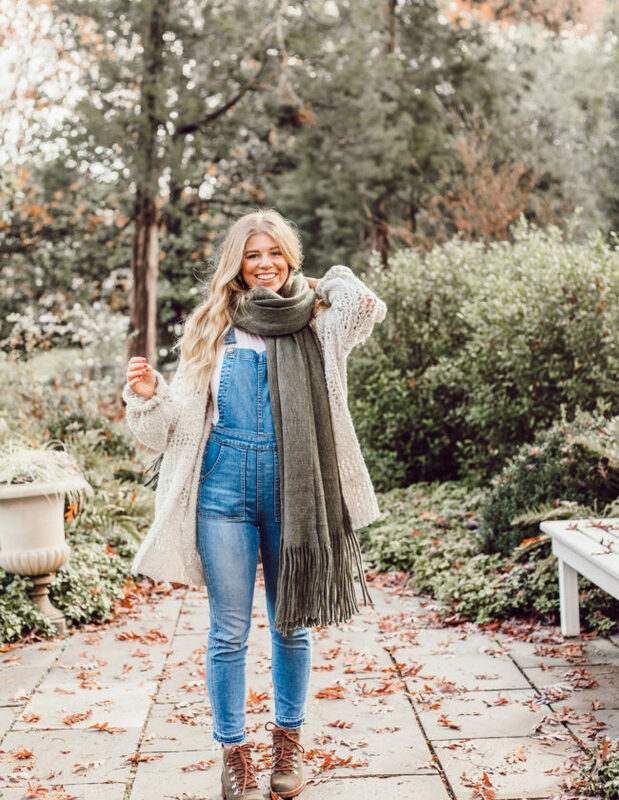 Love this outfit, especially for the mild days! It’s 65 in Boston today and I’m soaking it all in. Yes you absolutely do girl friend, you absolutely do!!! Thank you so much gal – yes with you on that. It’s 70 degrees here today and I am about to go out in the sunshine to soak up as much as possible! I love this casual look! Your coat looks so cozy! Thank you Belle! It definitely is! Quite literally “spicing” things up with that hat!! That color is so pretty! Haha that is so true! Thank you lady! I cannot get enough of that cozy cardigan. I love the winter white on you. And that hat? Swoon! Aw thank you gal! It truly is the coziest cardigan! I’m in love with that white coat! You need it girl friend! This is the coziest looking cardigan! I love the fit of it and this whole outfit is so chic! It truly is the coziest! So warm and feels as though you’re wearing a the plushiest of robes. Thank you Kileen! I am loving this outfit! The white coat is so pretty! Well hello perfect outfit!! Still can’t get over how cute you look in these cords! Those corduroy’s and the light in these pics!! STUNNING!! Thank you gal! Definitely is! Thank you so much gal! It is as cozy as it is cute!